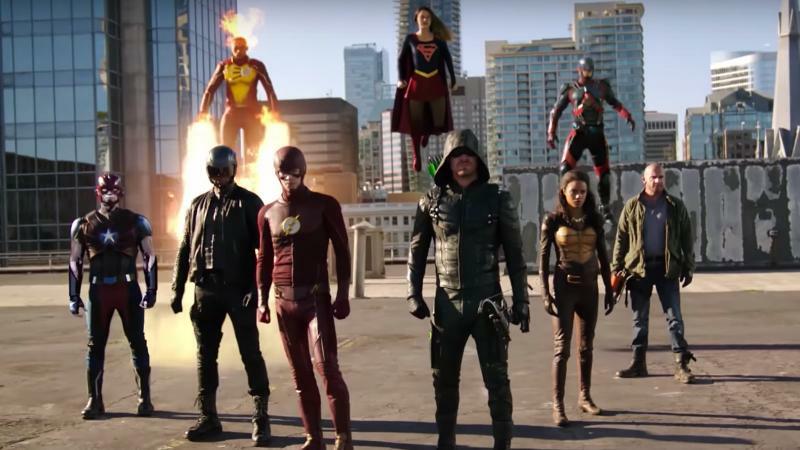 As we know, every summer I review the season of comic book TV, and look at who did what best. When there were only seven shows I was looking at, it was fun and easy. Then it was eleven. Then thirteen. And they just keep coming. So instead of reviewing like 20 shows next June, we’ll tackle them one by one over the next 11 months, as they end. Then hand out virtual trophies in June, as per usual. Fun! Fun for me, anyway, but let’s drag y’all along for the ride. It feels like it’s been longer than two and a half years since the Marvel Netflix universe kicked off. Two seasons of Daredevil and one each of Jessica Jones, Luke Cage, and Iron Fist have finally led to this: the Avengers of Marvel Netflix, The Defenders. Well… they sort of all led to this. Instead of all four shows blending together against a greater menace led by the franchise’s best villain, like in Avengers, what we have here is Jessica Jones and Luke Cage being dragged (kicking and screaming, in Jessica’s case) into a mash-up of Iron Fist and the worst part of Daredevil. Which doesn’t seem like the best starting point, but, well… how shall I put this. It ain’t Invasion!, but it’ll do. We open with a check-in on where the four leads are since last we saw them. Matt Murdock is doing his best to give up being Daredevil and focus on law; Jessica Jones is avoiding being a hero or taking cases and getting drunk; Luke Cage is fresh out of prison thanks to Foggy Nelson (probably used that whole “illegal fight club/human experimentation” thing to get some sentences commuted); and Danny Rand has been roaming the Earth with Colleen Wing hunting The Hand. The Hand, inconsistent villains of Iron Fist and worst part of Daredevil, take center stage as the main villains. Alexandra (Sigourney Weaver), the previously unseen true leader of The Hand, has been alive for centuries, but is now dying of an unspecified but incurable illness, and has blown the last of their immortality serum on resurrecting Elektra to be their ultimate weapon, the Black Sky. Sidebar: They actually do a decent job selling Elektra as an ultimate weapon, especially once we see that they don’t really need to conquer the world or anything. They already have global influence, they just need her to keep rival ninja death cults, K’un Lun warrior monks, or slightly enhanced crime fighters from getting up in their business. And she’s pretty good at that. Sure, when they flashed back to Alexandra acquiring Elektra, and her compatriot Sowande asked if she was still committed to this Black Sky plan, it would have been great if he’d added in “I’m just saying, turns out the Norse gods are real, one of them hangs out downtown, should we be adapting the plan?” But we’re very clearly past that. The movies and Marvel Netflix do not co-exist, let’s all just move on. More of a sidebar than I meant it to be… where was I… yes. Short on time, Alexandra speeds up The Hand’s work to acquire more of The Substance, the key to their immortality. The trick is, doing so will level Manhattan. Jessica Jones goes looking for an architect they dragged into their plans, Matt Murdock tries to keep her out of trouble, Luke Cage tries to help Harlem youths dragged into Hand grunt work that keeps getting them killed, and Danny Rand hunts Hand operatives, and that puts all of them on course for a big joint throwdown at Hand HQ. At the end of episode three. Having five fewer episodes than most Marvel Netflix shows does not push them to move at a more rapid pace. Because that’s the thing about Marvel Netflix, you see, as well as some other Netflix dramas. Their devotion to the streaming model means that they view the show as one eight-hour movie, rather than eight individual episodes. They have One Big Thing happen at the end of the hour to compel you to keep going, but then not much happens the other 40 minutes. Well, not much in terms of action beats. There are plenty of character moments, chats between the leads (the four main heroes, Colleen, and Claire), intrigues among Hand leadership. If you’re hoping for a whole bunch of superhero action, this isn’t the place. I think we know what is. But if you want to watch four reluctant heroes from very different lives learn to work as a team and bond as people, you could do a lot worse. Actually maybe you couldn’t, because that was a very specific description I just gave, I’m not sure there’s more than one… well, it could be a lot worse. Put another way, it’s talky. It’s very talky, short on action beats, and languidly paced, but the talky bits turned out to be largely worthwhile. Good team: The leads actually work well together. Watching them bounce off each other is interesting and engaging enough that you almost don’t notice how very, very talky the show is. Luke Cage and Danny Rand are actually a good enough duo that they come close to being the classic partnership they were in the comics. Matt and Jessica play off each other well enough I’m mad we’ll probably have to wait until a second Defenders season comes along to see them do it again. Closing some holes: We do get some answers to nagging questions about the shared Defenders-verse. Why didn’t Daredevil show up to help Luke Cage or Iron Fist? Because after the friendship-ruining shitstorm of season two he’s been retired. What was up with the rival Hand factions in Iron Fist? The Hand has five ethnically diverse leaders, they work independently more often than not, and they do not tend to get along. What the hell was up with that giant hole from Daredevil season two? Seventeen months later they finally explain. The Improving Iron Fist: Danny Rand is still a tool with a short fuse, no getting around that, and he surely does still like walking into a room filled with bad guys and saying “Hi, I’m Danny Rand, the Iron Fist, here to oppose you.” But having Luke and Jessica calling him out on his nonsense actually moves him towards being a better character. Hell, he even landed a couple of decent jokes and learned about privilege. Jessica Jones: I have missed you, you delightfully abrasive drunk. Daredevil fights good: The fight scenes might not be shot or edited as well as they could be, but at least the choreo and rehearsal times have improved since Iron Fist. Seeing Daredevil back in action is enough to remind us of when these guys were the best in the business at fight scenes. Not that they have the title back… so far that still belongs to Preacher. Villains: Sigourney Weaver crushes it as Alexandra, and Gao and company are effective menaces for the foursome (plus Coleen). Even Bakuto. And I’m pretty sure Matt found a big clue by playing the Daredevil opening theme on a piano. Underwritten support staff: They make a point of bringing in the key players from all four shows for at least parts of the season. But other than Colleen Wing, Matt’s old trainer Stick, and the omni-present Claire Temple, they do not have a lot to do. I’ll explain. Foggy Nelson and Karen Page are mostly there to say “Aw gee, Matt, don’t be Daredevil, you don’t gotta be Daredevil,” which is perhaps the least interesting and most frustrating thing they could be asked to do. We want Matt to be Daredevil. Anyone telling him not to be Daredevil is wasting our time. Jessica’s pals, Malcolm and Trish Walker, are basically just hostages, there to give Jessica skin in the game. Trish almost plays a larger role in the main story, then doesn’t. On three occasions. Waste of what was and probably will be a great character. And most frustrating is Misty Night. The heads of Marvel Netflix clearly like Misty, and they should, she brims over with potential, but they just do not know what to do with her. She spends most of the season reduced to saying “Tell me what’s going on! You have to, I’m the police, and actually on your side!” only to remain in the dark. They go through more “I can’t tell you the truth for your own safety” moments in eight episodes than The Flash manages in 23, and that is… not positive. So we’re still doing the whole “Swap villains in the third act” thing? Even if the first villain was great and the replacement is so-so? Even if having Elektra murder Alexandra and take over The Hand didn’t really add much? I mean I get that it seems like a neat twist, and maybe it would have been if Luke Cage hadn’t beaten you to it. Names: Can we be done with “The Devil of Hell’s Kitchen” now? He’s called Daredevil. Just call him Daredevil. Jesus. Put this next to “The Incredible Green Guy” and “The Blonde Dude with the Hammer” and it seems like Netflix thinks New Yorkers just like using the longest possible names for people. Which is clearly just madness. And it’s only people. World-altering alien invasions get called “the Incident” and everyone’s just okay with that. Double madness. Worst Behavior. In the third episode, Defenders actually start meeting each other and having conversations. And it works pretty well. Then in the end, all four finally link up for that aforementioned epic throwdown against the, sadly, non-ninja Hand troops. The H Word. In the first episode, we catch up with all four leads, and not one of them is in an interesting place. Three out of four have basically been in limbo since their last appearance, with Matt and Jessica trying their best not to be superheroes and Luke Cage in prison. And Danny Rand is Danny Rand. It makes for a slow start. Avengers didn’t open by convincing its leads to be heroes again. Okay, fine, except Banner. Kristen Ritter as Jessica Jones. Sure, she puts up the biggest fight to be part of the story, but she’s the most reliably fun part of the team. And her friends are trying to talk her into being a hero, not out of it. She also has most of the best lines (Luke Cage runs a decent second, especially his reaction to Danny’s origin), and gets a really satisfying hero moment at the end of episode four. Look… you have a lot of shows to make, a lot of characters to juggle, but you don’t film them at the same time, the leads aren’t Robert Downey Jr.-busy, there is now no reason that the leads can’t all guest star in each other’s shows. Before Iron Fist, we wanted to see Luke and Danny team-up. Post Defenders, we’re sold on it. And they all still live in the same city. There is no good reason to make us wait two or three years to see these people cross paths again. One more spoiler. One more BIIIIIG spoiler. Fine. Except Matt. Won’t be seeing him until Daredevil season three, which is… fourth? Fourth in the queue. 2019? Then-ish, unless they start making more of these each year. Man, they are going to sit on that cliffhanger longer than is warranted. Yup. This was the right call. No way trying to do 20 of these in June was going to work. Dan at the Movies: Valerian and the Etc. Etc. I wasn’t going to do this. Review Valerian and the City of 1000 Planets. You can tell because it’s been out for a while now and I’m just getting around to it. But it turns out that there are a couple of things about it I want to talk about. So let’s do this. The titular “City of 1000 Planets” is space station Alpha, which once was an Earth space station, but in the film’s intro gradually grows into a hub of interplanetary diplomacy and commerce. After wrapping a mission, interplanetary agents Valerian (Dane DeHaan) and Laureline (Cara Delevinge) return to the station to find themselves caught in an intrigue between their military bosses and a mysterious alien race. That’s about all I can say about the plot… not because not much happens, but because if I try to go into more detail it’ll get out of hand fast and I’ll describe way too much. But don’t worry. You’ll figure it all out. It is… not hard. If you can’t tell exactly where the story is going within half an hour… how fun your simple life must be. I’d love to be surprised that easily some days. The romantic subplot between Valerian and Laureline, because of course there is one, because why wouldn’t there be one other than not wanting to be trite… it’s forced and hackneyed. Very hackneyed. Someone who is 19 wrote the dialogue for that plotline. Luc Besson was late to set, so he gave an intern a Writing Romance For Dummies book and had them write Valerian’s dialogue in the car. I don’t think there was one scene involving Valerian trying to convince Laureline to marry him (they are not dating, by the way) that didn’t make me roll my eyes at the bland, passionless approach, and DeHaan’s uninspired take. The visuals on this film are incredible. It was honestly hard to be too upset with the wooden romantic arc when every ten minutes there was some new amazing sight, some new high-concept facet of this world splashing across the screen. I’m not one to throw around the phrase “Every frame a painting,” but hot damn this film is pretty to look at. And conceptually fascinating. I could spend entire seasons of a TV show devouring the ideas being thrown around. Big Market, a popular tourist market that exists in a different dimension, only accessible through special goggles, gloves, and hand-held portal devices, leading to a chase scene that simultaneously takes place in a back alley market and an empty desert. Telepathic jellyfish that form symbiotic relationships with massive sea creatures that, for some reason, live in Alpha. A truly dizzying red light district, featuring Rihanna as a shapeshifting exotic dancer/prostitute and a delightfully over-the-top Ethan Hawke as her… manager, I guess we could say? No. Pimp. Call it what it is. Honestly words aren’t enough. If you’ve seen the trailer, know that you’ve barely scratched the surface. How do they fit all of this stuff into one movie? That’s the thing I most wanted to cover. A little over halfway through I noticed something odd about the way the story was going. The main plot, as I said, isn’t super complex… but we hadn’t really touched on it in about half an hour. Valerian had gone missing chasing one of the aliens, then once Laureline found him, she got grabbed by a different group of aliens who banned outsiders. On a space station built around mingling. I mean, sure, your embassy is sovereign ground, but a whole– nope, it’s fine, don’t get distracted. So then Valerian has to pull off a complicated extraction, after which we finally begin to get back to the main story. I didn’t mind any of this, it was all engaging, I just happened to notice how long it had been since we’d addressed the main story and briefly thought it weird, until I realised what was happening. This movie is based on the French comic Valérian and Laureline. And that’s why this story keeps shifting from odd locale to odd locale, sub-plot to sub-plot. It isn’t just taking a comic story and making it into a three-act action movie like your average Marvel or DC movie, it’s doing comic-style storytelling on the big screen. Which is to say, it’s episodic. Each time the story takes a left turn or finds a new locale, that’s a new issue. And I can’t name a comic book movie off the top of my head that’s experimented with that. Does it work? It worked for me, because it allowed the movie to explore so much more of this fascinating and gorgeously realised world, and since the visuals and world-building are what the Besson was doing best here, more was definitely better. But if you found the story a little scattered I couldn’t particularly blame you. I do not officially endorse the consumption of mind-altering herbal substances (hi Mom), but this seems like an ideal movie to be super high for. It’s good but flawed, gorgeous but slightly hollow. It makes me fascinated by its world(s) but not quite its main characters. I’d watch it again, but not in a hurry. Of the movies I’ve seen this summer movie season (May-present) so far, it’s probably eighth, under either Spider-Man: Homecoming or Dunkirk. I have not made up my mind as to my feelings on Dunkirk. 4.5/5 for visuals, 3.5/5 for story, buoyed mostly by its different approach and high-concept space opera fun rather than its leads. Worth seeing, worth seeing on the big screen, but probably cheap theatres? Unless you have a really nice TV or something. Well if this isn’t the most half-assed endorsement you’ve ever read. But that’s Valerian.